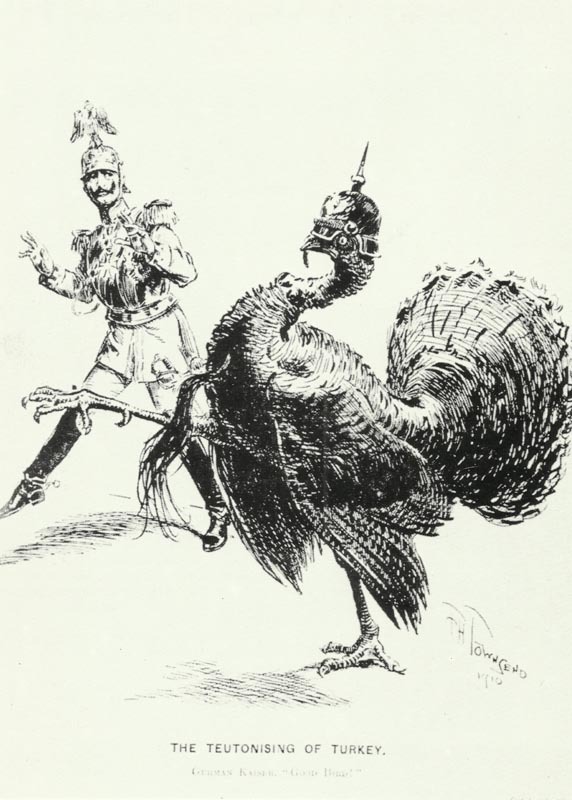 The Teutonising of Turkey: German Kaiser is happy about his helper and ‘Good bird’ in a British cartoon. Egypt: Turk feint attacks at Kantara and also at Kubri (7 miles north of Suez) until January 27. Persia: Chernozubov’s 7,000 men with 16 guns defeats c. 5,000 Turks at Saflan until January 28 and regains Tabriz on January 30. Britain: Churchill and French Minister of Marine Augagneur agree to French participation under British command in Dardanelles attack. Allies extend September 5, 1914 London agreement to Turkey. Russia: Grand Duke Nicholas replies Dardanelles action imperative but Russia cannot help. Flanders: Wilson (promoted to Lieutenant-General on February 18) becomes BEF Chief Liaison Officer to Foch (­until December 21, 1915). Aisne: French XVIII Corps recover lost ground at Craonne. Front static there to April 16, 1917. East Prussia: New German Tenth Army (4 corps) formed under Eichhorn for Masurian offensive (plans ready on January 28). Carpathians: Brusilov’s success near Dukla Pass. Extra corps on its way from Northwest Front. Austrian ammunition exhausted. German-Austrian Südarmee attacks, gains 100 yards per day. Brusilov strikes back on January 27, but repulsed near Beskid Pass on January 28. Italy: War Minister General Zupelli tells cabinet Army not ready until mid-April.